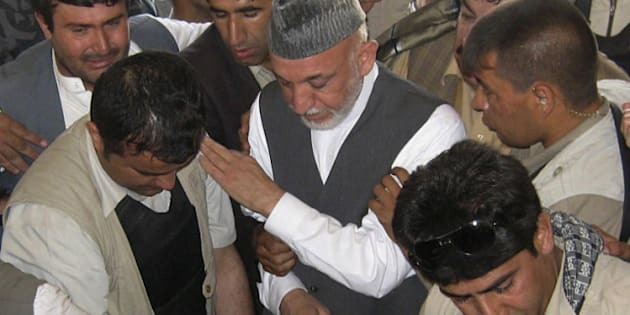 THE CANADIAN PRESS -- KANDAHAR, Afghanistan - Afghan officials now say five people are dead and 15 wounded after a suicide bomber set off an explosion at a memorial reception for Afghan President Hamid Karzai's murdered half brother. A spokesman for the provincial governor, Zalmai Ayubi, says no federal cabinet members were among the casualties. The president, who attended the funeral of Ahmed Wali Karzai on Wednesday, apparently returned to Kabul almost immediately afterward aboard a Canadian C-130J transport plane. Ayubi was at a loss to explain how a suicide bomber could get inside the reception of the country's most prominent political family. "After the VIPs and dignitaries left following the funeral, they decreased security," said the spokesman. "That was a mistake." A statement from the Interior Minister says the head of the cleric council for the province -- Hekmatullah Hekmat -- was among those killed. Ayubi says a couple of prominent elders were also casualties, but did not clarify whether they were among the dead or wounded. One of the was wounded was identified as Ismallah Afghanmal, a Kandahar member of the Mishrano Jirga -- the Afghan senate. The blast in the southwest part of the city comes one day after the funeral of Ahmed Wali, the political strongman of southern Afghanistan. The mosque, known as Sarra Jamai, was filled with relatives and friends who offered condolences to the family of the provincial council leader. Ahmed Wali -- or AWK as he was known -- was assassinated Tuesday at his home by a close associate of the Karzai family, who provided security around their ancestral village in Dand district, south of Kandahar city. Observers have feared the murder would set off a wave of revenge attacks in the province. No one has claimed responsibility for the explosion. The attack happened just as the U.N. released its latest report on civilian casualties in Afghanistan. The world body says the number of innocent people caught in bombings and other attacks was up 15 per cent in the first six months of 2011 compared with the same period last year. A total 1,462 Afghan civilians lost their lives, an increase of 191 over last year.